Smart Locks That You Need to Take a Long Look At. Security should be on the mind of nearly everyone. No homeowner wants to take the risk of burglary or home invasion. Many home automation enthusiasts usually utilize the services of a good home security system. However, smart locks can add one more line of defense. Today, locks are no longer just a device you slide a metal key into it and open the door. These days they can be wired into larger home security systems. Keys are no longer necessary for some. These locks can open using signals from a smartphone app. Here are a few of the new cutting-edge smart locks. First are the August locks that look strong and sleek. Easy to install, you can start tracking who comes and goes in your home in less than an hour. August allows you to lock and unlock your door with your phone, and extend permanent or temporary access to friends and family. The smart locks by August allow the homeowner to keep logs of who comes and goes. It will notify the owner via app whenever the door is locked or unlocked. It is also compatible with the Apple HomeKit and all Android-based smart hubs. Any product in the home automation market by Samsung tends to impress the crowds. Their smart locks are no exception. The SHS P718 comes with a touch panel and access point and a nice, sleek design that makes it stand out. With the ability to enter a simple access code, there is never a need for a key or a smartphone to lock or unlock it. Samsung also offers a fingerprint pad for even more ease in opening. The drawback that many consumers have when purchasing smart locks are access. Some are wary about the fingerprint lock or the numerical pad. Fears of hacking make many afraid of trying the phone app. THen there are some that still want the security of a traditional key. Ultraloq took all of that inot consideration when designing their locks. Ultraloq boasts a battery operated easily installed door lock that comes with most of these features standard (the phone app is on their pricer model). The lock is at home indoors or outdoors and can even sense when a person is near. Kwikset Kevo enjoys an industry-wide reputation as a popular smart lock system. This smart lock embeds a touch-triggered panel and also a key entry system. An added bonus in case you lost your phone or you don’t have your smartphone around. Like some of the other smart locks, you can give others access to the system via a smartphone. Durable, easy to install and use. Bringing over 130 years in lock sales and design, Yale offers something that is elegant and yet modern. Yale features a touchscreen panel for access codes and a traditional key optionBeautiful stylish design that fits every door. Yale smart locks offer modern features that allow you to see battery level 24/7 and wireless communication. Its beautiful style fits every door. In a comprehensive home security system, the lock that you pick for the door is key. After all, smart locks only enhance the safety of your home. 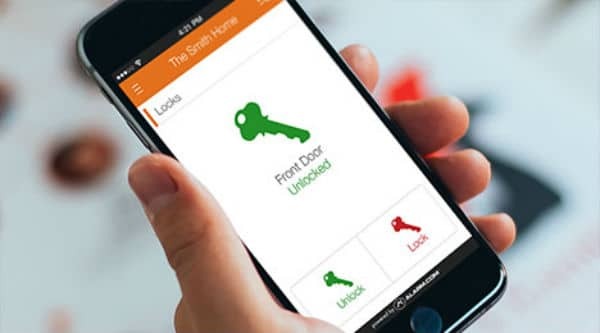 In a well-designed system, quality smart locks add another line of defense to your home security and automation system. Take care to choose the best for your circumstances. Have a favorite smart lock? Let us know in the comments below.